We kicked off the 2019 AFL season with a marginal winning week in Round 1, hitting on 5/9 betting tips all coming at odds of $1.90 or better! 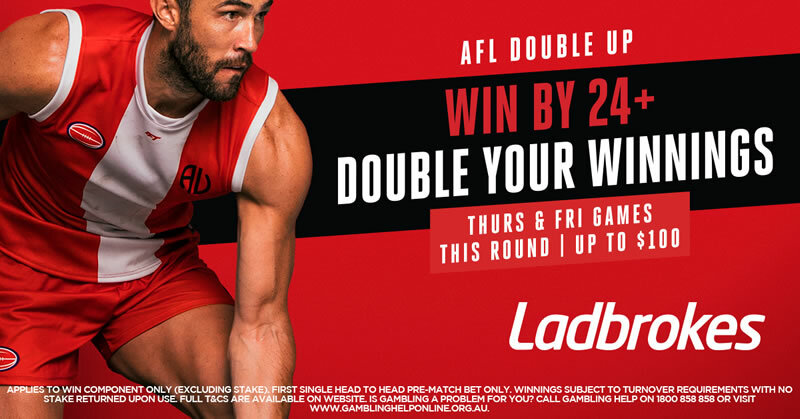 Round two offers another couple of great games on Thursday and Friday night respectively but it's the Saturday slate that we'll be focusing on today, if you want previews and tips for the rest of the Round 2 action, make sure you head to our AFL Tips Page. The Bombers will be looking to bounce back after an extremely disappointing beat down at the hands of the Giants in Round 1. After a lot of hype surrounding Essenondon in the pre-season, they served up a lacklustre performance on Sunday as they were smashed by GWS to the tune of 72 points. The Giants boasted the top four posession winners on the ground while just one Bombers player, Dyson Heppell, was able to accumulate 25 touches. The Saints should be fired up after a thrilling one point win over the Gold Coast in Round 1. It might not have been the best quality opponent but it was a solid performance at Marvel Stadium nontheless. Rookie Matt Parker was a standout for the Saints, racking up 17 touches and kicking two goals on debut while Jack Billings looked ominous, spending more time in the midfield and accumulating 28 touches. Disaposal efficiency was a big point of emphasis for the Saints moving into 2019 and they looked much more clean with the ball in Round 1. The Bombers, on the contrary, looked sluggish and fairly disinterested in their season opener. They were dominated in nearly every key stat including contested possessions, marks, tackles and possibly most glaringly, marks inside 50 where they were smashed 16-6. One thing the Saints have done fairly well despite an average record over the last few seasons is play under the roof at Etihad/Marvel. Hard to believe they start as 23.5 point underdogs here against a side that was just smashed by 72 points. The Power got their 2019 campaign off to a fantastic start as they downed one of the premiership favourites in the Demons by 26 points at the MCG on Saturday. They'll be back at Adelaide Oval this weekend, where they generally find another gear playing in front of their home fans. Tom Rockliff was fantastic in the win over Melbourne, racking up 44 touches, 10 marks and 8 tackles as he spent the majority of his time in the midfield. For the Blues, it was much of the same old story in their season opener against the Tigers. Carlton looked competitive for periods throughout the game but ultimately couldn't hang for for quarters with the 2017 premiers, going down by 33 points. Patrick Cripps was dominant as usual while Marc Muphy relished a new role across half forward and pinch hitting in the midfield with 29 touches and a goal. Nic Newman also proved to be a quality signing, racking up 26 touches and a goal. The Power start as 32.5 point favourites here, which we think is a touch low given how they looked against the Dees away from home last weekend. The Blues should get Matthew Kruezer back this weekend which will be crucial to help deal with the monster Port Adelaide line-up which includes Scott Lycett, Paddy Ryder and Justin Westhoff. Power should be too strong at home this weekend. The Cats were impressive in their season opener against the Magpies on Friday night. Trailing marginally for the majority of the night, they kicked three goals to two in the final quarter to edge out a seven point win. Patrick Dangerfield was the difference in the final quarter while the Gary Ablett forward experiment paid dividends as the little master racked up 23 touches, 2 goals and five score involvements. As we mentioned above, the Demons were throroughly outplayed by the Power in Round 1, going down by 26 points at the MCG. Max Gawn, arguably Melbourne's best player, was largely ineffective in the game, having just 21 hitouts and 13 touches but more importantly just three total marks and none inside 50. Gawn needs to get forward and be damaging on the scoreboard if the Demons are going to be successful, especially without Jesse Hogan in the forward line. The Demons really struggled to find an avenue to goal on the weekend and they'll need more from the likes of Sam Weideman and Tom McDonald moving forward. Steven May and Kade Kolodjashnij will make their Melbourne debuts this weekendto bolster the defence while the Cats could bring in ruckman Zac Smith. Geelong really impressed on Friday night and Melbourne have some real issues playing at GMHBA Stadium in Geelong. They have won just one of their last seven games down in Geelong, dating back to the famous 186 point drubbing they recieved in 2011. More recently in 2016, they were smashed by 111 in Geelong. We like the Cats to win here. The Eagles will be looking to bounce back from an extremely disappointing season opener in Brisbane on Saturday night. The reigning premiers were handled comfortably by the Lions to the tune of 44 points as the majority of the big Eagles names failed to fire. Granted, the Eagles were without a few key players in Jamie Cripps, Josh Kennedy, Andrew Gaff and Nic Naitanui, with Kennedy and Cripps likely to return this weekend. Led by star midfielder Stephen Coniglio, the Giants put the Bombers to the sword on Sunday of Round 1. Coniglio racked up 31 touches and kicked three goals in the 72 point win while Jeremy Cameron also looked ominous with four goals. Regardless of how many quality midfielders the Giants lose, it seems to just be the notion of 'next man up' down at GWS, as Tim Taranto and Jacob Hopper filled the shoes of departed mids Tom Scully and Dylan Shiel by accumulating 58 touches and two goals between them. The Giants might have lost some key players in the off-season, but make no mistake, they still posses one of the most damaging lists in the entire AFL. Unbelievably, Josh Kelly is still to return to this side, which he looks set to do this weekend along with Nick Haynes. Love GWS at the line here.